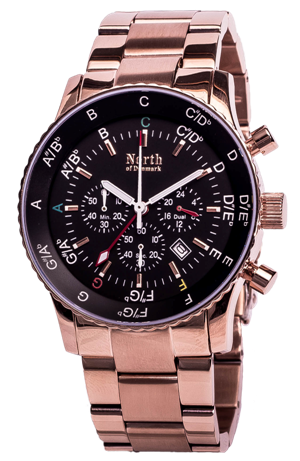 The watch can be used as a transpose wheel from one key to another by rotating the outer ring (bezel) with nodes relative to the nodes on the dial. 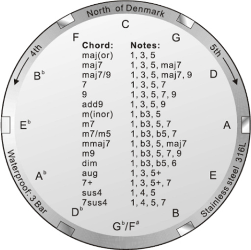 The watch can also immediately show the main chords that belong to a given key. Place the selected key (on the outer ring) next to the green "C" on the dial. The chords for the selected key can now be read on the outer ring next to the green "C", the yellow "F" and the red "G". E.g. if you place "A" (on the outer ring) next to the green "C" on the dial, the chords for the key of A can be read to: A, D and E.
Music Theory calls the green "C", the yellow "F" and the red "G", respectively for tonic, subdominant and dominant. The blue "A" indicates the parallel key. You can download an interactive demo of the MusicPilot Watch here. The watch has a stopwatch that can measure up to 59M 59S so it is possible to "time" a performance where a "set" typically is 45 minutes. 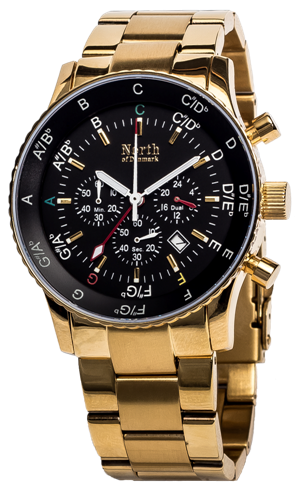 Finally, the watch also has an alternate time zone, so it is possible to keep track of time at home and wherever you may be in the world at the same time. 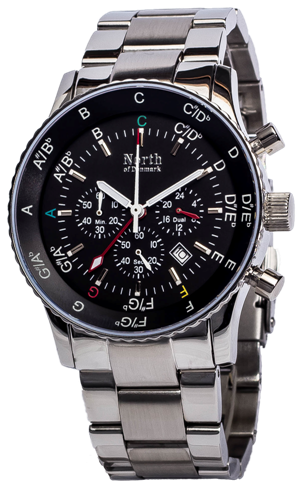 The watch is equipped with scratch-resistant sapphire crystal and is water resistant to 3 atm. (30m). The watch has indices and logo in silver and the hands are white with inlays of Super-Luminova, making them very easy to read in bright daylight as well as darkness (on the scene). The individual nodes are luminescent, which means that the watch functions can be used in all lighting conditions (scene). 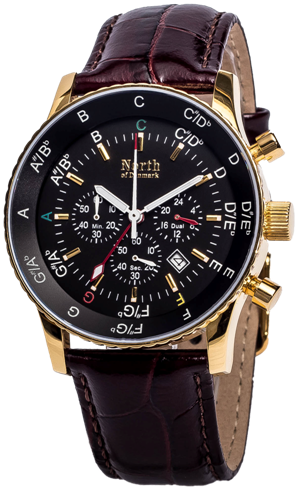 The watch comes with exclusive solid metal bracelet (blank with matte middle segment) and a water-resistant leather strap. In addition to the steel version a limited number of 18-carat gold plate and 18 carat rosé gold plate is made. Plating thickness is 0.8 microns, which is approx. 5 times thicker than the standard jewel-plating, which is to 0175 microns. 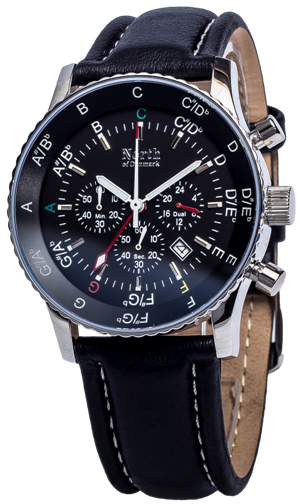 The movement in the watch is a Citizen Miyota FS26 Analogue/Quartz.